Interested in a career at an AZA-accredited zoo? 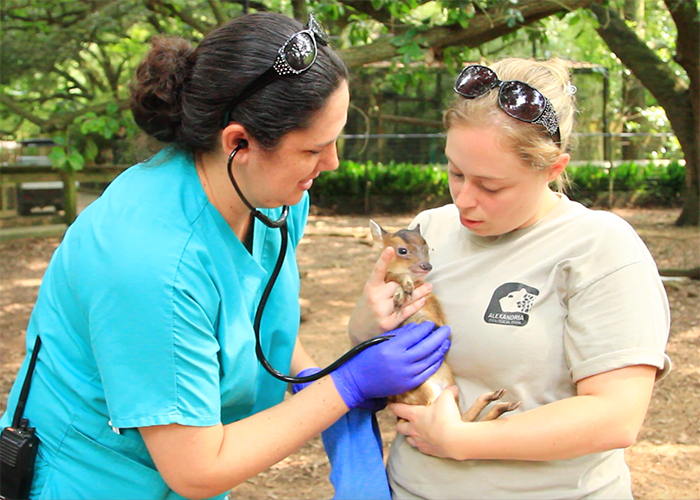 Alexandria Zoo’s passionate, dedicated team is committed to the animals in our care, conserving wildlife and their habitats both locally and globally, and inspiring people in our community and beyond to take positive actions to protect wildlife. Alexandria Zoo is an Equal Opportunity Employer. Health Curator will work with the staff veterinarian in maintaining the health care of the animal collection. The health curator is responsible for the husbandry and treatment of the hospitalized and quarantined animals, as well as the few exhibits surrounding the hospital. Maintain the cleanliness of the hospital and quarantine building; keep hospital stocked of medical supplies and drugs. Schedule collection of laboratory samples and run any in house tests; assist veterinarian in diagnostic testing and surgical procedures, and enter all medical records into ZIMS computer program. Curator will work with keepers in operant conditioning for medical procedures and with enrichment for the collection. As a member of senior staff, curators will meet monthly with health care and animal management committees, serve as a first responder, assist with public relations, and assist with interview process of zookeepers. Zoo keeper I is responsible for daily care of zoo/exotic animals; this is an entry level position. Duties include preparing diets, feeding animals in assigned area, cleaning exhibits, minor repairs in exhibits, grounds maintenance in and around exhibits, supplying enrichment to assigned animals, operant conditioning, interaction with visitors, “keeper chats”, assist with animal programs for education classes, assist with set-up and work during special events, and assist with general daily running of the facility.